He then asked the Lord to “touch these stones … with thy finger, and prepare them that they may shine forth in darkness” (Ether 2:4).2 As petitioned, the Lord touched them “one by one” (v. 6), which caused them to “shine in darkness, to give light unto men, women, and children, that they might not cross the great waters in darkness” (Ether 6:3). With these interpretations in mind, it is noteworthy that the stones only received their light after the Lord touched them “one by one with his finger” (Ether 3:6). In this sense, it can be understood that the light which provides revelation, which reveals one’s true identity, which acts as a constant guide through darkness and danger, and which fills the emptiness of the mortal heart with true joy and divine purpose can only be activated through personal contact with Jesus Christ.18 Ultimately, the brother of Jared believed that stones could shine with light because he had faith in Jesus Christ—the true “light and life of the world” (3 Nephi 11:11). John A. Tvedtnes, “Glowing Stones in Ancient and Medieval Lore,” Journal of Book of Mormon Studies 6, no. 2 (1997): 99–123. Hugh Nibley, Lehi in the Desert/The World of the Jaredites/There Were Jaredites, The Collected Works of Hugh Nibley, Volume 5 (Salt Lake City and Provo, UT: Deseret Book and FARMS, 1988), 358–379. Hugh Nibley, An Approach to the Book of Mormon, The Collected Works of Hugh Nibley, Volume 6 (Salt Lake City and Provo, UT: Deseret Book and FARMS, 1988), 337–358. 1. For a discussion of the ancient transparent stones formed through intensive heat, see Hugh Nibley, Lehi in the Desert/The World of the Jaredites/There Were Jaredites, The Collected Works of Hugh Nibley, Volume 5 (Salt Lake City and Provo, UT: Deseret Book and FARMS, 1988), 370–371. For analysis of the term “molten,” see Royal Skousen, Analysis of Textual Variants of the Book of Mormon: Part 6, 3 Nephi 19–Moroni 10 (Provo, UT: FARMS, 2006), 3754. For a discussion of glass in the ancient world, see Nibley, The World of the Jaredites, 216–218. 2. For information concerning Gazelem, “a stone, which shall shine forth in darkness unto light” (Alma 37:23), see Book of Mormon Central, “Why Was a Stone Used as an Aid in Translating the Book of Mormon? (Alma 37:23),” KnoWhy 145 (July 18, 2016). See also, Book of Mormon Central, “Why Is a Seer Greater Than a Prophet? (Mosiah 8:15),” KnoWhy 86 (August 26, 2016). 3. Hugh Nibley, An Approach to the Book of Mormon, 2nd edition (Salt Lake City, UT: Deseret Book, 1976), 285. 4. For a treatment of criticisms regarding the shining stones in the Jaredite barges, see Nibley, An Approach to the Book of Mormon, 273–274. For the scientific plausibility of shining stones, see Nicholas Read, Jae R. Ballif, John W. Welch, Bill Evenson, Kathleen Reynolds Gee, and Matthew Roper, “New Light on the Shining Stones of the Jaredites,” in Pressing Forward with the Book of Mormon: The FARMS Updates of the 1990s, ed. John W. Welch and Melvin J. Thorne (Provo, UT: FARMS, 1999), 253–255. 5. John A. Tvedtnes, “Glowing Stones in Ancient and Medieval Lore,” Journal of Book of Mormon Studies 6, no. 2 (1997): 99–123. 7. Babylonian Talmud: Tractate Sanhedrin 108b, trans. H. Freedman, ed. Isidore Epstein (London, UK: Soncino Press, 1935, reprinted 1952, 1956, and 1961), online at come-and-hear.com. 8. Midrash Rabbah, trans. H. Freedman, ed. H. Freedman and Maurice Simon (London, UK: Soncino Press, 1939, reprinted 1951 and 1961), 244, online at archive.org. This glowing stone is referred to as the “tzohar” in Jewish mysticism and is present in the stories of Noah and Abraham. See Rashi on Genesis 16:66:16, B. Sanhedrin 108b, B. Bava Batra 16b, Zohar 1:11a–11b. See also Howard Schwartz, Tree of Souls: The Mythology of Judaism (New York, NY: Oxford University Press, 2004), 85–88; 332, for traditions on this glowing stone. 9. Hugh Nibley explained, “The description of the ships suggests nothing in the Bible, where aside from its general dimensions (which are symbolic) nothing is said as to how the ark actually looked; but it exactly matches the description of those sacred magur boats in which, according to the oldest Babylonian stories, the hero of the Flood was saved from destruction.” See Hugh Nibley, Since Cumorah, The Collected Works of Hugh Nibley, Volume 7 (Salt Lake City and Provo, UT: Deseret Book and FARMS, 1988), 209–210. Since Cumorah originally ran as a series in the Improvement Era from 1964–1967. For parallels between the Jaredite barges and the ship in the Babylonian flood story, see Nibley, An Approach to the Book of Mormon, 276–281. 10. The story of Noah and the flood would have been relatively recent history for the Jaredites, who had departed from the, “great tower, at the time the Lord confounded the language of the people” (Ether 1:33). For information concerning the historicity of the tower of Babel, see Michael R. Ash, “Challenging Issues, Keeping the Faith: Is the Tower of Babel Historical or Mythological?” Deseret News, September 27, 2010, accessed October 28, 2016 at deseretnews.com: “When we shine the light of science and scholarship on the Tower of Babel, we find some interesting things. First, the word ‘Babel’ comes from an Assyro-Babylonian word that means ‘Gate of God’ and is related to a Hebrew word that means ‘confusion.’ It appears that the author(s) of the Babel account are engaging in some word-play to make a particular point about the story. It’s also interesting to note that the book of Ether never mentions ‘Babel’ but simply the ‘great tower.’” For an extensive treatment of the Tower of Babel, see Jeffrey M. Bradshaw and David J. Larsen, In God’s Image and Likeness 2: Enoch, Noah, and the Tower of Babel (Salt Lake City, UT: Eborn Books and The Interpreter Foundation, 2014), 379–434. 11. Nibley, An Approach to the Book of Mormon, 285. 12. 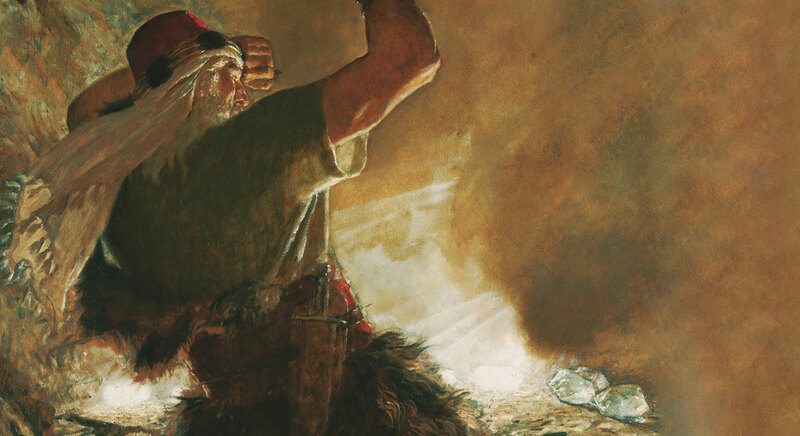 When Moroni gave his lengthy interjection in Ether 12, he provided numerous examples of faithful prophets and then placed the brother of Jared as the capstone example of faith (Ether 12:20–21). In the same way that the brother of Jared obtained faith by following the example of Noah, readers can obtain faith by following the example of the brother of Jared, whose faith was so strong that “the Lord could not withhold anything from his sight; wherefore he showed him all things, for he could no longer be kept without the veil” (v. 21). 13. Jeffrey R. Holland, “Rending the Veil of Unbelief,” in A Book of Mormon Treasury: Gospel Insights from General Authorities and Religious Educators (Provo, UT: Religious Studies Center, Brigham Young University, 2003), 55. 14. M. Catherine Thomas, “The Brother of Jared at the Veil,” in Temples of the Ancient World: Ritual and Symbolism, ed. Donald W. Parry (Salt Lake City and Provo, UT: Deseret Book and FARMS, 1994), 391. For more information about the Urim and Thummim, see Paul Y. Hoskisson, “Urim and Thummim,” Encyclopedia of Mormonism, 4 vols. ed. Daniel H. Ludlow (New York, NY: Macmillan, 1992), 4:1499–1500; Cornelis Van Dam, The Urim and Thummim: A Means of Revelation in Ancient Israel (Winona Lake, IN: Eisenbrauns, 1997); Matthew Roper, “Teraphim and the Urim and Thummim,” Insights: A Window on the Ancient World 20, no. 9 (September 2000): 2. Stan Spencer, “Reflections of Urim: Hebrew Poetry Sheds Light on the Directors-Interpreters Mystery,” Interpreter: A Journal of Mormon Scripture 14 (2015): 187–207. 15. Thomas R. Valletta, “Jared and His Brother,” in The Book of Mormon: Fourth Nephi Through Moroni, From Zion to Destruction, ed. Monte S. Nyman and Charles D. Tate, Jr. (Provo, UT: Religious Studies Center, Brigham Young University, 1995), 315. 16. Robert E. Clark, “The Type at the Border: An Inquiry into Book of Mormon Typology,” Journal of Book of Mormon Studies 2, no. 2 (1993): 75. 17. Thomas, “The Brother of Jared at the Veil,” 391. 18. The description of Christ touching the stones “one by one” and filling them with light is symbolic of his pattern of personal ministry. See Book of Mormon Central, “Why Did Jesus Minister to the People One by One? (3 Nephi 17:21),” KnoWhy 209 (October 14, 2016).